Eppa Hunton (1823-1908), Brigadier General, CSA (VA). Participated in Sharpsburg, Gettysburg (WIA- "Pickett's Charge"), and the Virginia overland campaign. 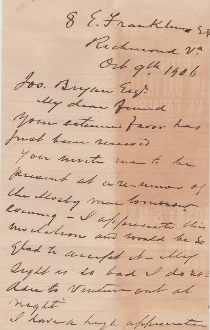 Autograph Letter Signed (ALS), 2 pages, 8vo., Richmond, Va. Oct. 9th, 1906. "...You invite me to be present at re-union of the Mosby men tomorrow evening. I appreciate this invitation and would be so glad to accept it. My sight is so bad I do not dare to venture out at night. I have a huge appreciation of the service rendered by Col. Mosby and his gallant men to the "lost cause" which we love so dearly. The infirmities of age must be respected and submitted to without a murmur. Present me very kindly and cordially to the gallant Col. and his brave men and believe me always. Some age discoloration on the first and last pages, otherwise dark ink and legible.